Local educators are unsure how the Clark County School District’s expected budget shortfall of $50 million to $60 million will affect their schools. The district will release its budget reflecting the deficit to the schools that day. “We are doing our best to make things work with the budget we have at this time,” she added. In August, the district announced a hiring freeze for nonessential employees, jobs not funded by grants, including open teaching and support staff, because of a larger potential budget deficit that could require $70 million to $80 million in cuts. District spokeswoman Kirsten Searer said the higher amount is because the district has been spending money on services during the first few weeks of school that will add to the shortfall. At their Aug. 24 meeting, board trustees, anticipating the $50 million to $60 million deficit, approved $43.3 million in cuts, including reductions in special education instructor facilitator services, student services, the Extended School Year Program, communications and school police. The district is estimating that individual schools will have to reduce their budgets by $17.4 million in the first stage of cutting. The district is also planning to reduce staff in October to help with the deficit and has said almost every department and school will “most likely” be affected. Tony Gelsone, principal of King Elementary School, said he is expecting budget cuts for King as well as losing an aide position. He added the school is moving forward with the staff and money it has in order to ensure the students and staff are minimally impacted by any of the potential cuts. 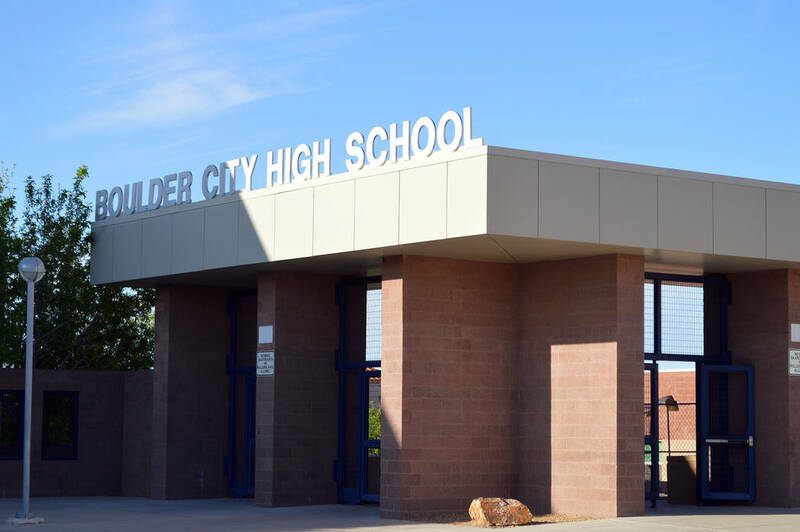 Boulder City High School Principal Amy Wagner said they have no idea how the high school will be affected by the budget shortfall in the district. At the school organizational team meeting Aug. 30, Wagner did say she thought they would be OK when all was said and done, and she hoped the school would have enough money for the things they had allocated for. According to a memo sent to the school district’s central services team from Superintendent Pat Skorkowsky and Chief Financial Officer Jason Goudie, the $70 million to $80 million budget shortfall has been caused primarily by lower-than-expected revenue from the state, increased costs due to collective bargaining agreements and other increasing expenses. An email sent to education professionals by the Clark County Education Association, however, said that at the end of the 2017 legislative session the school district received $140 million more from the state for 2017-2019. “It boils down to this: Gov. (Brian) Sandoval and the Legislature sent down 2.25 percent more money this biennium than last and CCSD should have more than $100 million in the bank from the ending fund balance, the amount of money they save when a teaching position is unfilled or filled by a long-term sub,” said Chris Bires, science teacher at BCHS. In a video posted to the district’s website, Trustee Linda Young said the district is struggling to keep up with increasing employee costs and benefits. Skorkowsky, in that same video, added that the district is receiving more per student, but it’s not enough to keep up with the growing costs. It received an extra $126 per student this year, but it would need $159 per student to accommodate cost-of-living increases, step increases for employees and $1 more per employee for health care. Several of the schools in Boulder City had higher enrollments than state projections for the year, which could lessen their budget issues. “One area in which we are fortunate at Mitchell is that we have about 20 more students right now than we were projected to have in the spring, and since schools receive more money when enrollment is higher, our budget will be in better shape than it otherwise could have been, and with that in mind, the cuts shouldn’t be as bad for us as they might be for other schools,” Day said. The high school also had a higher enrollment, which Bires estimates will give the school between $300,000 and $400,000 more than expected. As of the Aug. 30 meeting, the high school’s enrollment was 630 students, according to Wagner. The original projection was 587 students. Wagner added that the incoming freshman class has 165 students, which is 38 more than projected. Las Vegas Review-Journal reporters Amelia Pak-Harvey and Meghin Delaney contributed to this article.